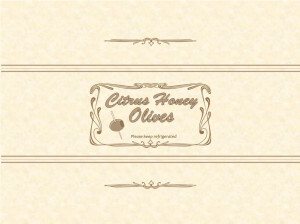 A few weeks ago, I was studying in a local tea shop and decided to order the citrus honey olives. What happened next might have been embarrassing if I was with anyone else; I shoveled them into my face at a very rapid pace. 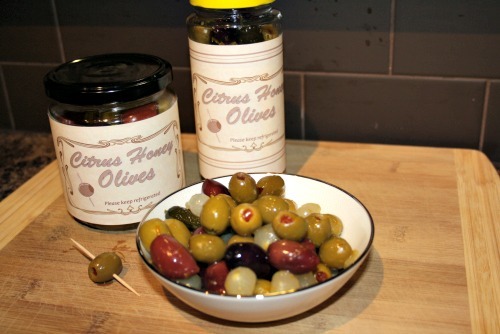 That got me thinking that I really needed to try to make some, so I could shovel them into my face in the privacy of my own home, all to myself, because my spouse is an olive-hater. I also figured that they would make a great little gift to have on hand for the Christmas season, they would be just the right size to take to neighbours, co-workers and dinners out. They turned out so well that I think I will have to make a second batch in very short order! Note: All of these measures are approximate, adjust the quantities to suit your tastes! 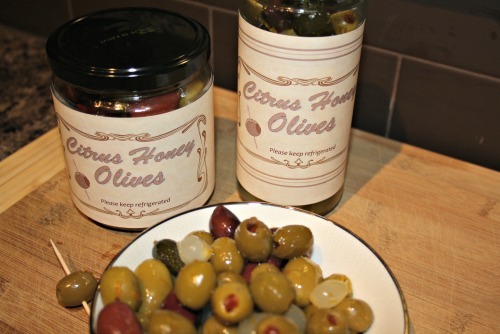 For mixed pickled things, pick from olives, sweet pickled onions and pickles. 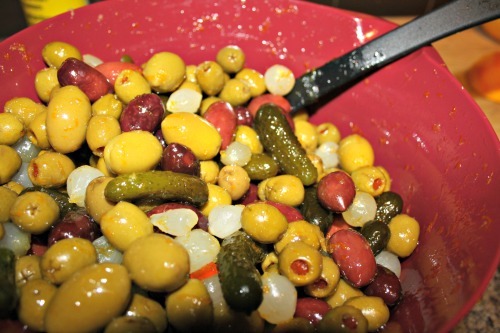 Approximately 10 cups of pickled stuff: stuffed green olives with pimento, kalamata olives, spanish queen olives, sweet pickled onions and sweet baby gherkins. Empty glass jars from the pickles that I had purchased for this purpose (how very generous of the store to include those lovely glass jars with the olives!). I also used some empty store jam jars and a sweet and sour jar. You could also very easily use mason jars. When you pick your pickled stuff (yes, Peter Piper was invited to this little party), you want a combination of colours that will look good in the end. I mostly selected based on price, opting for only two jars of Kalamata olives because they were substantially more expensive than the Spanish Queens, the onions or the gherkins. I grabbed the gherkins at the last minute to add some more colour variation. 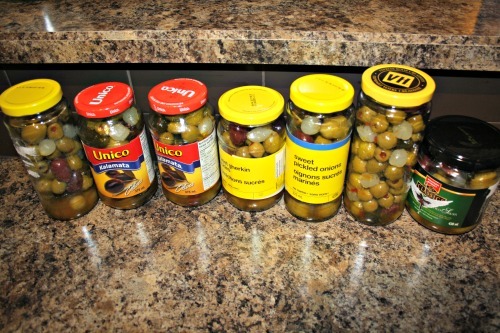 The large jar of green olives with pimento was $8.88 at my grocery store. Overall, these cost me around $2 each to make. Step one is to determine what you are going to use for jars. 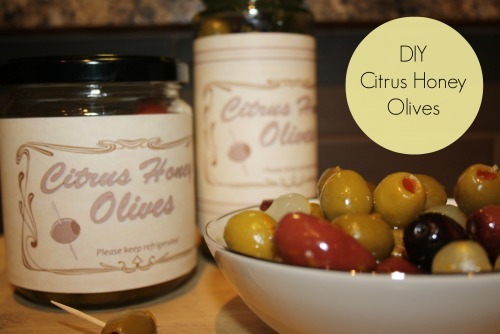 If they are just for home use, you could mix them up these citrus honey olives and put them in a plastic container in the fridge, then in a bowl for serving. 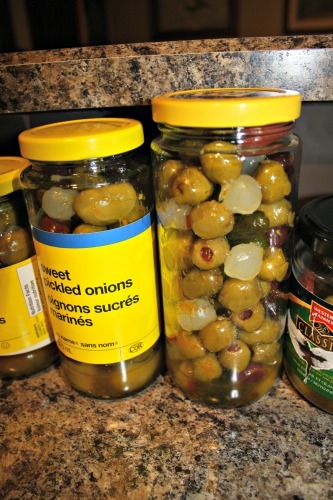 If you want to give them as gifts, I highly recommend re-purposing the jars you bought the olives in, if they are an appropriate size. I had recently been on a fridge clean-out kick, so was able to use some empty sauce jars. You have two choices when reusing jars. The first one, which you will have to do if they used to hold non-pickled stuff, is to attempt to remove the labels and thoroughly wash (or run the the dishwasher) the jars and lids. If, however, you are using the jars you are about to empty, you could theoretically get away with removing labels (if they’ll come off, many of mine wouldn’t!) and rinsing out the jars, as you will be returning the same contents to the insides as was there in the beginning. The choice is yours. 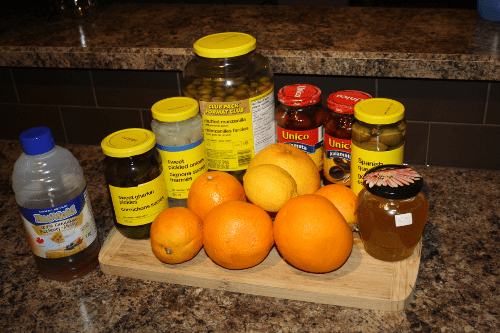 A third option is to use cleaned and sterilized canning jars. 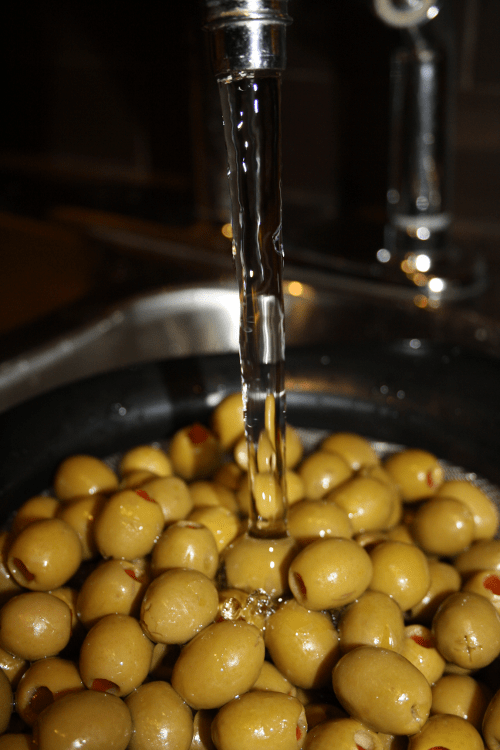 To actually make the olives, start by dumping jars of olives into the strainer and rinsing them under the tap. We don’t want the saltiness to overpower the sweetness, and we want the honey to be able to stick to the outsides. Then gently dump them into a (very) large mixing bowl. 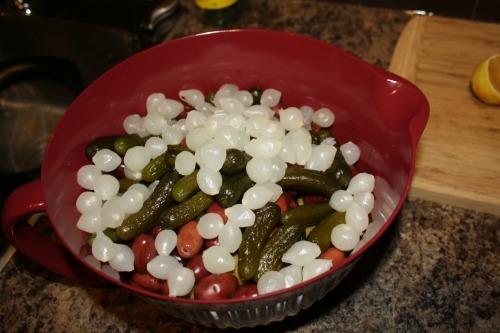 Rinse your onions, remaining olives, pickles or whatever else you are including. If you are going to be washing the store jars, now’s the time to pop them in the dishwasher. If you’re hand washing, you can do that while the honey is simmering. Next, zest your citrus. Zest lots and lots of citrus, you want enough that there is a good coating on every single olive. 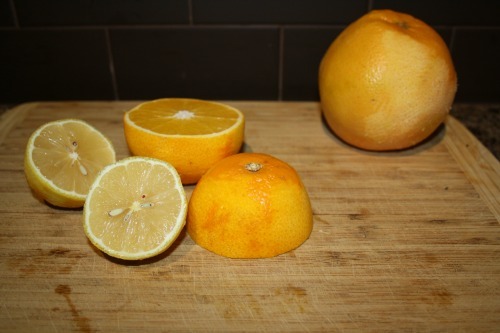 Grapefruits tend to have a strong flavour, so don’t go overboard with them unless you really like grapefruit. You can zest directly into the pan. 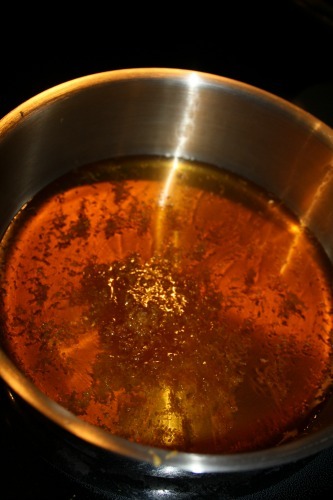 Put the zest and honey in a heavy pot on the stove and simmer for five to ten minutes. Don’t let it get so hot that it burns! You want to release a bunch of that lovely citrus flavour. 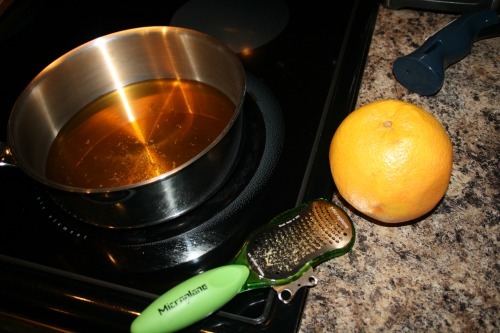 Then add the juice of half an orange and a bit of the juice of a lemon. Simmer for a few more minutes. If you are hand washing the jars, do it while you wait. Remove the honey mix from the stove and pour it over your large mixing bowl. Now very gently mix the whole thing, trying to avoid squishing and ripping them. 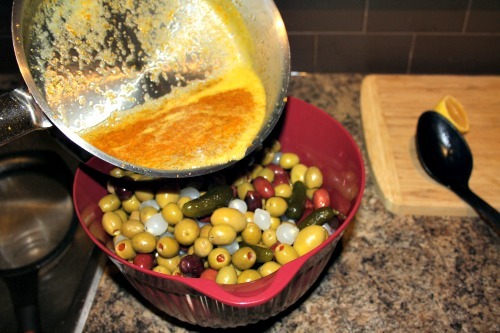 When the mixture is coating everything and the colours are all dispersed, start filling your jars with the olive mix. 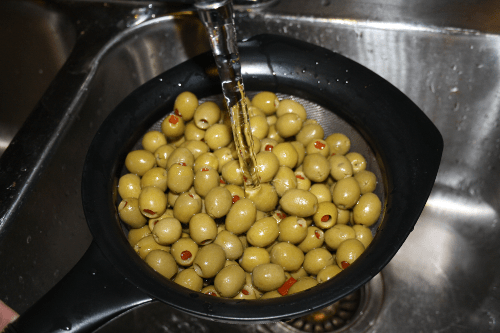 Once all of the olives are in jars, split the liquid that’s left at the bottom of the bowl equally into the jars. The more liquid, the better, as that’s where all of the flavour sits! Wipe off the rims and sides of your jars and screw on the lids. You’re almost done! Important: One of the reasons that canning works to preserve food is because of the pH of the food. By switching halfway from salt to sugar, we are drastically changing the pH and the method of preserving. 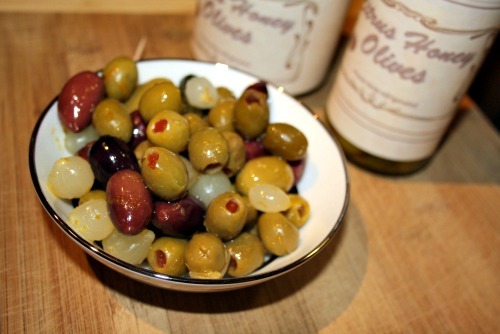 For that reason, these delicious olives need to find their way right back to the fridge and be kept there until they are consumed within a few weeks of being made. You can print off the free label that I made here by clicking here and then clicking print, or pressing Ctrl + P. This image takes up a whole letter sized sheet of paper, so that you can cut it to the size you need for your jar. Crop the image on your computer first, to save ink. Cut the label down to the size that you need and use a dab of glue, some tape, or some double sided tape to affix the label to your jar. Consider adding a small square of fabric to the lid and tying with twine or ribbon. These taste pretty good right away, but are even better after a week of marinading! Shake the jar before serving, to ensure everything is deliciously coated in honey and citrus! They look delicious because they are! PS: Thanks to Frugal Portland for telling me about a photo editor that would shrink all of these! Wow those look good! I can see them going really well with a drink… or in one! Great gift idea and some excellent pics to show how to do it! I love this idea! I’m obsessed with honey, and I love citrus. This is definitely a nice project to try. They are so good! I could eat the entire batch myself, probably in a week!